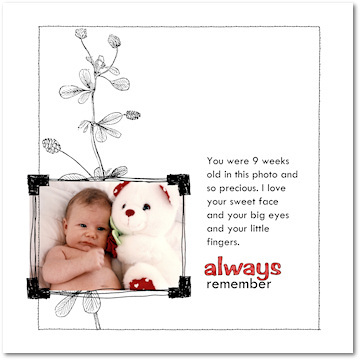 One easy, yet striking, scrapbook layout style is to leave areas of white space on your page. White space, which is sometimes called negative space, is the open space between your photos, text and scrapbook graphics. It doesn’t have to be white. Colored backgrounds and even very pale patterned backgrounds will work just as well. One way to create the white-space style is by clustering your photo, title and journaling on one side of the scrapbook page. If the page looks off balance, try adding or moving text or scrapbook graphics to the opposite side. The result is a simple, elegant and dramatic scrapbook page. KB and Friends specializes in digital vintage, retro and whimsical designs. Our products include ABC flashcards, invitations, book covers, scrapbook embellishments and party goods. © 2010 - 2017 KB and Friends. Powered by Blogger.